STUNNING STUNNING STUNNING with CAMEO OBVERSE! A superior example among its peers, this Walking Liberty offers eye-appeal and quality FAR beyond the typical Walking Liberty. Deep, RARE mirrors are haze-free without distracting blemishes. I cannot tell you enough how incredibly attractive and gorgeous the mirrors are on this Walker! I rarely come across an example such as this! The cherry on top? The stunning Cameo devices on the obverse! Liberty and the rising sun are painted in bright, snow-white to create EXTREMELY rare and hard-to-find black-and-white eye-appeal! 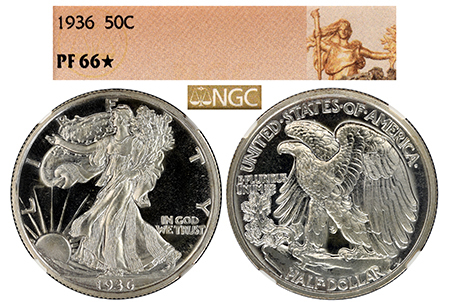 This is 1 of only 11 examples graded PF 66 STAR, and there are NO examples graded Cameo! This is as close as it gets!